I'm finally uploading some photos. I've put up a set from Maker Faire, which includes a subset of Craft Hamsters @ Maker Faire. I was really impressed by people's creativity. 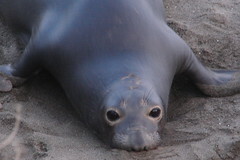 You also might want to check out the Elephant Seals of San Simeon. We took a detour on the way home from San Mateo just to see them. They're loud and stinky, but so cute! Up next: Photos from our weekend in the desert for the Scion United event. Wow. They look so cute.